Hakea multilineata is one of many handsome and colourful hakeas from Western Australia. Hakea multilineata is known as the Grass-leaf Hakea and is a medium to tall, upright shrub that has reached a height of five metres in our cold climate garden. Broadly linear leaves are thick, flat, up to 20 centimetres long with many longitudinal veins (hence the species name). Flowers are carried in large, spectacular racemes. The racemes are often clustered together forming large spikes. Blooms are an eye-catching reddish-pink. The flowering season extends for June to October. The peak flowering, in our cold climate garden, occurs in August. Flowers are followed by clusters of egg-shaped, beaked woody fruits containing the usual two winged seeds. Hakea multilineata could be used as a colourful addition to informal hedges and screens. 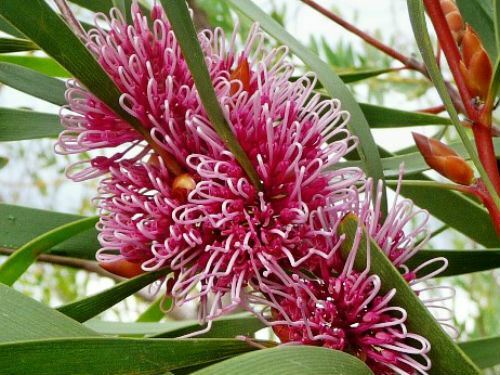 In our garden the Grass-leaf Hakea has proved to be hardy, free-flowering with very low water requirements once established. Propagate from seeds and possibly cuttings.